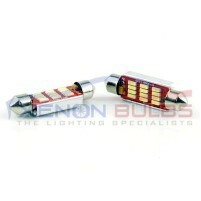 36mm FESTOON BULBS LED 6 SMD CANBUS ERROR FREE.. 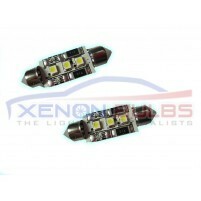 This model of CANBUS 36MM Festoon High Power LED bulbs has a total of 3 SMD LEDs built into each bul..
2pcs 36MM 39MM 42MM 12 SMD 4014 CANBUS LED'S White..
CAN Bus LED replacement bulbs can fit numerous vehicle applications, including interior dome lights,..
36mm 3 SMD SAMSUNG CANBUS LED'S..
2 x 36mm 3 SMD SAMSUNG CANBUS LED'S Brand New In the Market, Unique design so maximum lig..
36MM 3SMD FESTOON BULBS ..
2 x 36MM FESTOON BULBS Commonly used for: Number Plate Interior Under ..
36mm Cree Canbus LED c5w White..
A pair of high quality 36mm 5W CREE LED Canbus Festoon Bulbs colour of xenon white. 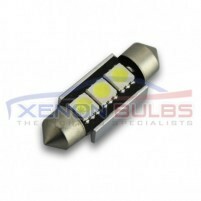 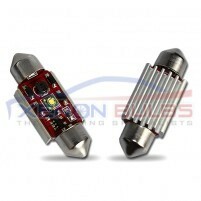 These bulbs are ..
36MM FESTOON BULBS LED 3SMD CANBUS ERROR FREE..